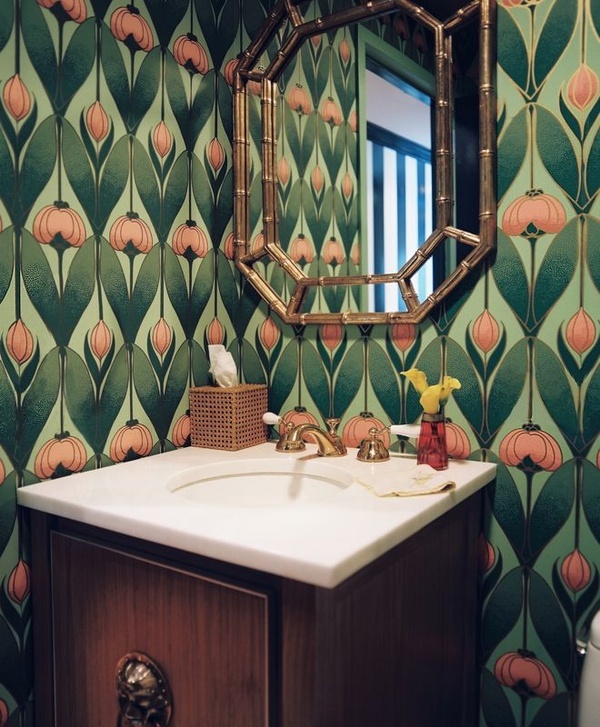 La Maison Boheme: Wallpaper in the Bathroom? 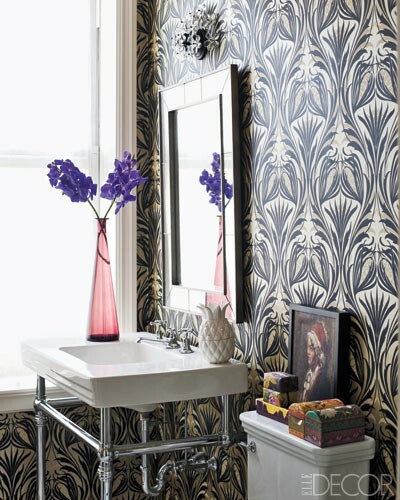 I love love love the idea of wallpaper in the bathroom. However, I have clear childhood memories of watching steam-damaged wallpaper peel away from the corners of bathroom walls. Paper and water usually don't mix, so what's the scoop? Are water damage worries a thing of the past? Are the new papers steam resistant or something? Tell me what you know. I'm so in love with that last picture! 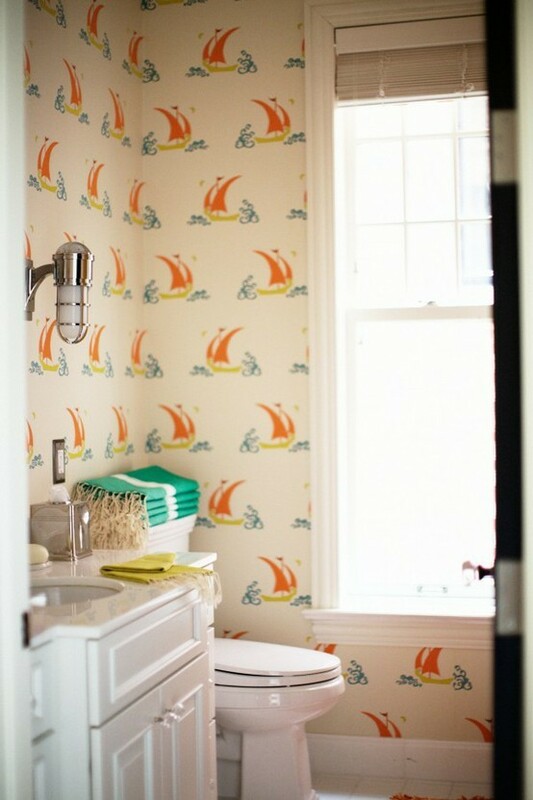 I remember a beautiful wallpapered bath in my Mamaw's house back in the 50's. I always wanted to find that paper. Never did, but had some papered bathrooms with good luck. My Dad, who was a professional paint and wallpaper hanger taught me to always use wallpaper paste (even if it is already prepasted) when papering a bath or kitchen. Seemed to work. The pastes and papers aren't improved, but ventilation is. The key is to thoroughly clean the walls before application for best adhesion. I would love that paper in the first photo in a bathroom that is all white. Or the last photo in a larger bathroom. The patterns seem to shrink the rooms and make them look cluttered but they are beautiful ! I think Raina is right. If you had paper in a small bath with a shower and little ventilation it may very well start to peel. 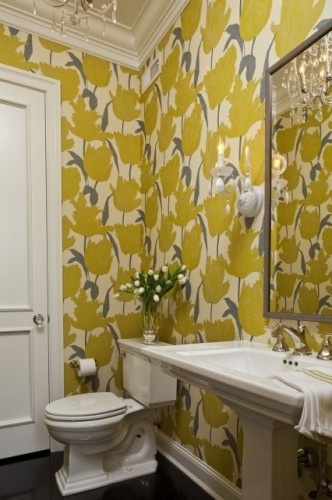 That is why I love beautiful papers in Powder Rooms! 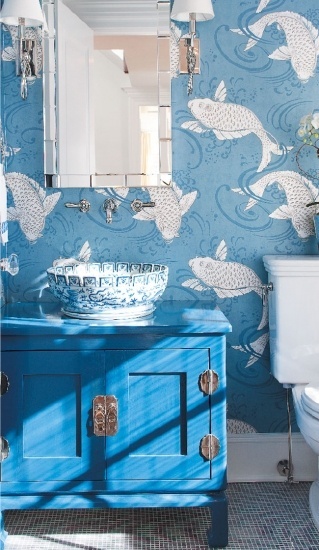 Anyone know where to get the top wallpaper with the white fish on the blue background? Would love to find it!